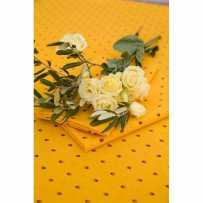 With its bright and cheerful colors, the Tradition printed cotton napkin can be used every day. For your meals taken in the kitchen or for dinner on the terrace, it will decorate the table with simplicity. The repetition of calissons, here represented by alternating flowers with tiny bunches of leaves, is typical of old Provençal cotton fabrics. They were used in the manufacture of everyday linen to escape the monotony of plain fabrics. We could assimilate them to peas, but these calissons have their own identity: they belong to Provence. The company Marat d'Avignon makes them live through republished fabrics to preserve the traditions. The name of the print is not chosen at random. It is indeed the quality of a product "made in Provence" that you are about to buy. 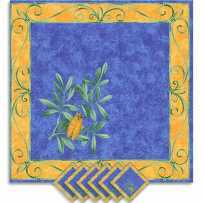 They can also go with rectangular placemats simple or framed, or even octagonal. Table mats and table runners also quilted are available. A bread basket made in the same pattern is presented as table accessories. In kitchenware, the apron with insulated gloves and potholders can be useful. There is a lot of choice in this purely Provencal collection.